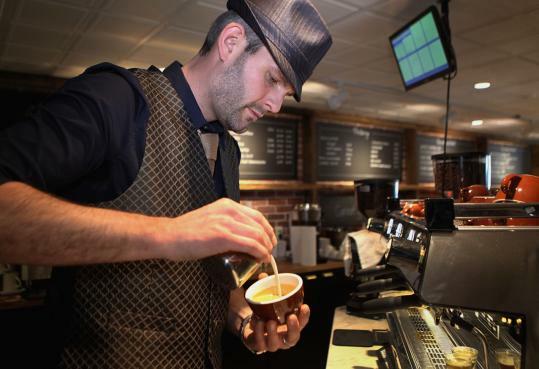 Thinking Cup, which opened across from the Boston Common on Dec. 14, is the only shop in Boston to exclusively use the popular Oregon-based Stumptown Coffee, which it receives from the company’s Brooklyn roastery the day after roasting. The cafe also boasts on-site pastry chef Meghann Osmon, formerly of Bin 26. Osmon supervises the shop’s menu, from flaky croissants ($2.50-$2.75) to quinoa salad ($5.99), but her contribution is most obvious in the pastry cases by the entrance, filled with mini chocolate and red velvet cupcakes ($1.95), decadent chocolate mousse cakes ($6.25) and fluffy cheesecakes ($5.95). The lunch menu features six sandwiches, including roast beef on ciabatta with caramelized onions, mixed greens, provolone, and tiny pickles ($8.95); and grilled cheese ($4.95), which pairs perfectly with tomato-cheddar soup ($4.95).